...but we do have some green tomatoes waiting for us to enjoy. J. 's family recipe of Kosher Green Tomatoes, ready in another month or so. What family recipes did you enjoy this Thanksgiving?? Some of my attempts over the last month to catch L.'s gorgeous smile on camera. He lights up a room, I tell you. N: "Mommy, L. looks like a gwobby. A gwobby is a cute fing." N. (Refusing to put barrettes in her hair): "But I don't want to be cute like L.!!" N.: "Mommy, what I like best about L. is everything." N. (Finding the pink sugar stars cereal in the back of the cupboard where I have hidden it): "Mommy, you told me there was no more pink! HA! (laughs hysterically in a very dramatic, exaggerated way) That was FUNNY!" N. (Every single time I drop her off at preschool): "Is everyone going to be here the same?" N. (One day when I pick her up at preschool and ask her how her day was): "Awesome fun!" 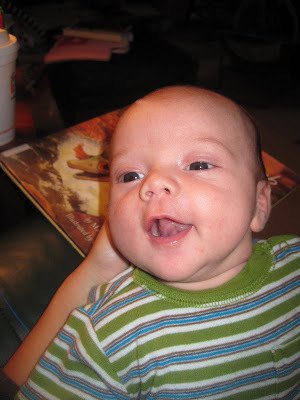 N. (Laughing at the fact that her baby brother's crying has stopped because he loudly relieved a gas bubble): HA! O.! L. tooted! He had a goose bubble!" N. (Anytime she is caught in a naughty act of some sort and asked what she's up to): "Nufing. Nufing!" N. "Don't tell me I am cute. I am beautiful." O. (walking once again to the bus stop): "What if we had buttons on us? We could just press them and swoop! Be there!" O. (upon hearing a dinner plan on a night J. is out of town): "Is it going to be brinner?? Yeah! We want pancakes and cereal!" O. (playing some sort of 'pretend we're animals and chase each other around' game with N.): "Bite me!!" O. (putting the dog outside on a woodsmoke air scented fall evening): "It smells like barbecue chips out there!" O. (watching baby wildebeests get eaten by crocodiles on Great Migrations): "Doesn't God even care that they get killed?" N: "We can do adopt, O." O: "Do you even know what adopt means?" N: "Yes, it means when you are sick." O: "No. It means when you get a pet. You adopt a pet." N.: "Who will play Prince Eric and Ariel with me? O. (not in the mood to play along): "You can be Belle when she was by herself." He couldn't be cuter, especially since he's started to smile for real. You know, when you can actually see it in their eyes, lit up and glowing just for you. At times it's almost a full blown laugh, and last night I noticed a dimple! I've been trying to catch the smile on camera, but haven't been quite successful yet, or I'd share a photo with you. Of course, all this cuteness and desire to make him smile more encourages the ridiculous sort of baby talk that before you had babies you promised yourself you would never engage in. Makes you want to coo, babble, and throw all sorts of silly nicknames at the baby, as if their own carefully chosen name just doesn't fit this bundle of sweetness. 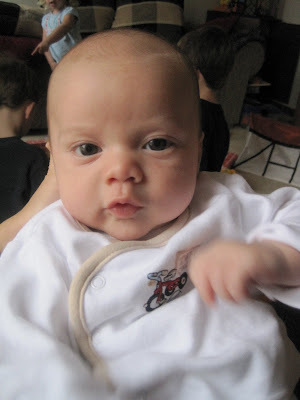 Problem is, since he's baby number three, I find we've run out of nicknames. I pick him up out of his swing and say "Hi there, Bud!" and my five year old says "Hi, Mom!" He cries, and I croon "It's okay, sweetie pie, you're okay. Mommy has you," and my three year old comes running. "I'm okay, Mommy. I not cwying." So. We're in need of some nickname suggestions, because we seem to have used all the obvious on our older two, and they are pretty possessive of them. O. truly does go by O. as it's an obvious shortening of his name. He also answers to Bud, Buddy, Monkey and Chief. My pet name for him is Boo. N. has a nickname that's a combo of her first and middle names. She also responds to Sweetie Pie, Sweet Girl, and Sweet Pea. Unfortunately, I'm not a fan of shortenings or lengthening of L's name, though O. has taken to calling him Leo (not his real name, though it was in the running). I'm looking for something that comes naturally, but doesn't sound strange. I'm leaning a little towards Bug. Neighbors of ours growing up had a "P" nickname for each of their kids: Punkin, Peanut, and Peaches. I like this sort of tradition, and now am wishing we'd started something similar. Oh well, too late. Perhaps I'm making too big a deal of this? All I know is, J. has started calling him Booger. Please, some better suggestions before this sticks??? Most readers of this blog know that I am a former high school English teacher, and thus a huge proponent of all things literary. More importantly, I've been a voracious and enthusiastic reader since birth, practically. There has never been a time in my memory that books have not been among the most important items in my world. Therefore, when my firstborn son came on the scene, I devoted much of my attention to developing those same interests in him. I read him Goodnight Moon, Snugglepuppy, The Little Train and all the other big name titles while he was snuggled in his pumpkin seat. "Which is bigger, Mom? A million or a thousand?" We have bookshelves in every room in the house except for the bathrooms and the dining room. And there used to be one in the dining room until we got bigger furniture in there. "What comes after twenty again? And then what? And then? And then?" We just recently cleared out the shelf under the coffee table because it had gotten so overflowing with books that you couldn't walk past it without upsetting the delicate balance of stacked piles of board books. "Hey Mom, that's a pattern!" J. and I read at least two books a night to each kid at bedtime. Lately, I've been sharing my favorite chapter books from childhood with O. (The Mouse and the Motorcycle, The BFG, Rabbit Hill) as well as introducing him to new series (The Magic Tree House, Dinosaur Cove). "I can count to infinity in a minute, Mom. Want to hear? One, infinity!" We make weekly trips to the library, participating in story time and carting home overflowing bags of books and books on tape at each visit. "How long is five minutes, Mom?" J. and I read the newspaper every morning. I carry my Kindle from room to room in the house, have at least two books I'm reading on my nightstand at all times, and subscribe to upwards of five magazine titles. I very clearly model reading behavior. "Hey Mom. There are more boys than girls in our family now. Unless you count Scout, but she's a dog, right?" I carry alphabet and sight word flash cards around in my purse. "At school today, we played with attribute blocks! Attributes are like thick and thin." So tell me, how did I end up with a math kid?? You know, in case you ever find yourself in need of one. This is Where J. Would Mention "Your Tax Dollars At Work." I'm always up for something new to watch on TV, especially something that I think J. and I might enjoy together. So, I often set the DVR for a new series purely on speculative hope. It's only rarely it actually results in a winner. Surprisingly, it's been PBS that's been rewarding in the last couple of weeks. I'm planning to spend most of my evening planted in my leather chair nest watching Fringe, but since one of the shows I'd like to recommend is on tonight, thought I'd pop in and share. The first show that I'm digging right now is Sherlock, a new series produced as part of Masterpiece Mystery. It's a Sherlock Holmes reinvention, featuring the character as he might be if he lived in modern day London. It's like a good procedural police show, only with one of my favorite characters of all time. I love all the reincarnations of Sherlock Holmes, literary and film-wise. Young Sherlock Holmes ranks right up there among my all time favorite movies, and I enjoyed seeing Robert Downey Jr. take on the role (even if I fell asleep for part of the actual movie). I'm always recommending Laurie R. King's excellent series of books featuring Mary Russell, protege and eventual wife of Sherlock Holmes. In fact, one of the classes I imagine myself someday teaching, when and if I get my dream job being able to invent thematic based literature courses*, would be to explore all these different versions of the great detective. You can bet we'd watch some episodes of House. I'd also be adding this new series to the syllabus. Sherlock, as played by Benedict Cumberbatch, is almost a sociopath, and solving cases is his way of staving off boredom and keeping his savant-type brain exercised. He's almost uncomfortable to watch, but fascinating. Watson, played by Martin Freeman (who will also supposedly be playing Bilbo Baggins in the upcoming Hobbit!! ), is the character you end up relating to, as he's pulled into Holmes' world and cases nearly against his will, purely because he can't wait to see what will happen next. Anyhow, it's a series well worth checking out. It's on Sunday at 9:00 on PBS, and you can catch up on the first two episodes online. I don't have as much to say about the other series, which is on tonight at 9:00. It's Circus, and it's a really well done documentary/reality show following a smaller one ring circus based in New York called the Big Apple Circus. It follows all of the major acts and the people who make the show happen first as they prepare for their touring season and then as they go on the road. I really enjoyed the plotline involving a clown just starting out with the show, and the tremendous pressure the other clowns put on him to get his act right. Also fascinating was the ringhand (circus version of construction worker/stagehand) who left his home in Iowa to join the circus, then apparently threatened to bomb the circus which landed him in jail. I'm intrigued by the fact that it seems you are either born into the circus, and continue a generations old tradition, or you come to the circus to completely reinvent yourself and your past. I think you'd also enjoy this show. If you decide to take me up on these recommendations, and you need to get caught up, you can watch the full episodes of Circus here and of Sherlock here. *Yes, this is the sort of geeky thing I fantasize about. It turns out this is what I miss about teaching. That and the way that high school kids are truly funny and can make you laugh out loud every single day (with, not AT them). Course, they also make you want to cry most days. Early today, I moved the Halloween candy from its spot on the kitchen counter to the top of the refrigerator. I was hoping to avoid further screaming tantrums from N. for not allowing her to eat an entire Hershey's bar after lunch. (Which for her, consisted of a corner of a slice of American cheese, half a container of yogurt and two Triscuits.) I found the Frisch's coupons they got at the zoo trick or treating, each good for a free kids meal. At one o'clock this afternoon, taking the kids to Frisch's sounded like a good plan. J. is out of town, so it would be just me, but that should be no problem. Nice little outing, the kids might actually eat something, it will be marginally healthier than a Happy Meal, and I would save some cash. By about five o'clock, this plan was sounding less and less attractive. O and N were sliding around on the kitchen floor, fighting over Skittles and a toy plastic egg, and picking up a nice coating of crumbs and dog hair. L. was ramping up for a session of wailing, and I was nearing the end of my patience. Dinner in an actual restaurant, even one as casual as Frisch's, was sounding a little beyond my means. I had visions of myself hissing at O. and N. to get up from under the table, stop ripping up napkins into one thousand pieces, and just take turns with the orange crayon for god's sake, all while trying to cut up food on three plates and hold a pacifier in L's mouth. No way. However, cooking these days requires some forethought. As it is next to impossible to chop or spread anything while holding a baby, I have to do those sorts of preparation while a nap is underway, or L. is at least happy in his swing for a while. I had not done any of that. Even the idea of throwing some chicken nuggets in the oven or making eggs or frozen waffles seemed a little too much. The floor sliding and wailing would only increase as I did even those simple tasks. Besides, I was hungry. A bowl of Rice Chex for me at 6:00 just means I'll be hitting the Cheezits at 10:00. So. The alternatives were these. Order a pizza. Get takeout from somewhere. Drive-thru. And here's the thing. All three of these options still involve me actually plating food and putting it on the table. Even a happy meal involves dividing up the fries and apple dippers, squeezing out the ketchup, and making the milks less spillable. Take out means I still have to traipse all three kids into the restaurant, back out to the car, and still plate the food. I decided to give Big Boy a try. L. had finally given in to sleep and was sucking on his pacifier in the car seat like a champ. The big kids* were thrilled and promised to behave. On the way in, we met our babysitter coming out. She's currently unavailable to us on weeknights, as she has play practice every evening. I was tempted to offer her double the usual pay to skip it tonight and come sit with us, but I am stronger than that. Do you know what? We got through the meal pretty well. O. and N. ate about eight bites of his pancakes, but shared his bacon with his sister. N. was confused by her pizza sticks, but ate all of her applesauce. L., of course, woke up just as my patty melt arrived and proceeded to cry pretty much unconsolably. O. and N. stopped eating at this point and started playing peek a boo with each other under the table, and it all started to go downhill. But guess what else? I did not have to make that food. And everyone got something different to eat, exactly what they wanted. It got brought right to our table. The waiter gave them both the same color twisty straw because he knew they would fight over different colors. When a fork fell on the floor, I didn't have to get up to get another one. There were napkins for everyone. And the best of all? The kind woman manager (maybe a grandma?) noticed that L. was not being soothed by his pacifier anymore and offered to hold him for me so I could finish my dinner. She put him up on her shoulder and walked him around the salad bar, and he stopped crying and looked around. We got out of there with suckers for each kid that could eat one, and one hour of my long evening was gone. Maybe the staff at Frisch's tonight was just feeling pity for me. Maybe it's a little sad that my interactions with adults today consisted of this meal and an exchange with the cashier at Kohl's. I don't think so, though. It probably would have been easier to do the drive thru tonight, but I'm happy we chose instead to interact with the world even just a little. *I find it really strange that I suddenly find myself thinking of my family as consisting of two "big kids" and a baby. Aren't they ALL babies?? Used about half of these and the baby zucchinis to make my favorite raw tomato/olive oil sauce for linguine and we had it for dinner last night. Saving the rest for some last BLT's with my own tomatoes. I think the yellow tomatoes were my favorites this season, so I'll be planting more than one of those next year. It seems it ended up being mostly a cucumber/tomato garden this year, and really, that's okay. The zucchini never got going. The plant was healthy looking enough, and produced a lot of blossoms, but only about four actual squash, and you can see how big they got. The research I've done suggests my problem was poor pollination, so I guess I'm a victim of the bee crisis too. I guess I could have pollinated by hand, but I'm just not sure I'm there yet as a gardener. This was the only watermelon. N. enjoyed it on Sunday. This ended up being a good thing. I planted the seeds for these when I thought O. had outgrown his melon allergy, but then it resurfaced about halfway through the summer with hives after eating both watermelon and cantaloupe. And here are the green tomatoes. Decided to go ahead and pick them. I am amazed at how many the plants just keep producing. Evidence of just how hot it's been this fall. If it weren't going to frost this week, we'd probably continue to have red tomatoes until Thanksgiving! 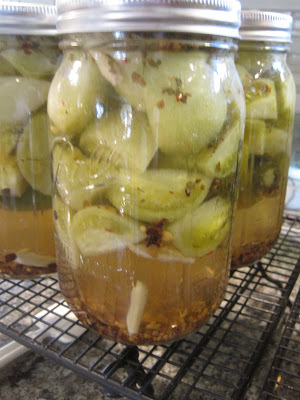 I just got the recipe for Kosher Green Tomatoes (pickled hot tomatoes) from J. 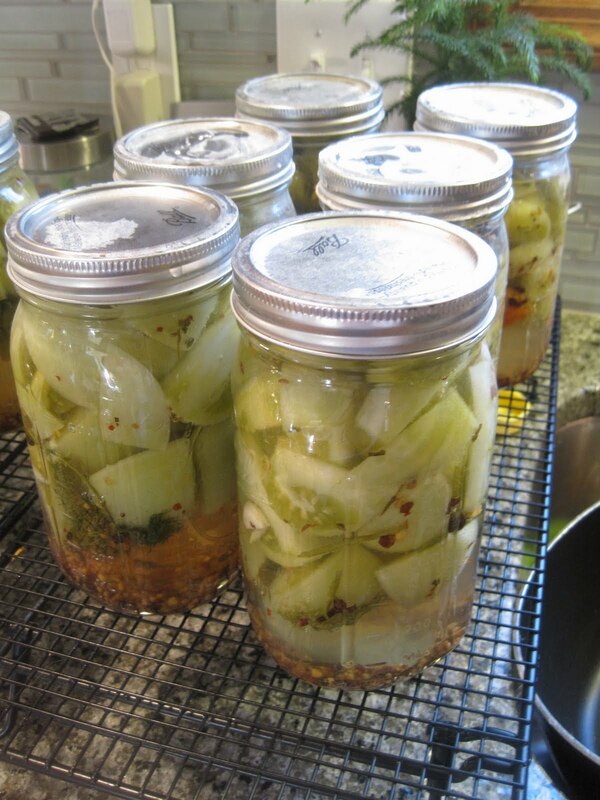 's aunt and uncle, so we may have one more canning adventure ahead of us. If not, anyone for fried green tomatoes?? 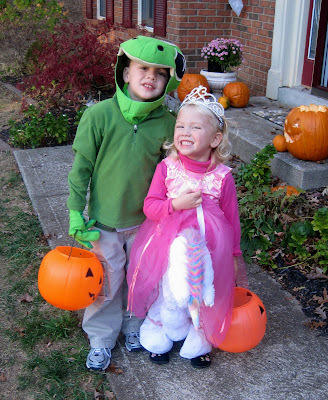 Here are my gecko, pumpkin and princess riding a unicorn getting ready for Trick or Treating. Even after sorting for nuts, still plenty of candy to keep them happy until Easter.